Van rentals, convertibles, luxury cars, SUVs and sports cars are some of the most popular & highly rented categories at the Memphis International Airport. Rent a car for Memphis International Airport in just three quick steps - search, compare, reserve! Cancel your Memphis International Airport car rental for free, up to 48 hours before the pickup time. Car rental at Memphis international Airport (MEM) gives easy commuting option to travelers arriving at the airport. 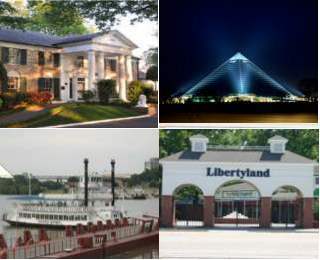 Being one of the major cities of Tennessee, Memphis has lot of sites to see and places to visit and a car rental at Memphis international Airport is a good option. We present you with high quality Memphis international Airport car rental deals at best prices along with inclusions like roadside assistance, unlimited mileage, theft and damage waiver and a 24/7 customer support. Car rental at Memphis international Airport with us also gives you access to finest collection of small size and high end cars to choose from. Also known as “America’s Aerotropolis”, Memphis International Airport hosts more than ten million passengers on international and domestic flights a year. What makes it stand out from all the other airports in USA is that it is not just an airport, but an extended complex with businesses and residences surrounding it. Another thing that allows Memphis International Airport to stand out from all the other airports out there is that it actually has an arts program to entertain the passengers waiting for the flight or stopping over the city. This outstanding airport aims to give their passengers first class treatment not only through services but also through different features such as shopping venues scattered throughout the three terminals with shops such as Godiva, Hudson Booksellers and many more shops for last minute shopping. Customers can also dine in the assorted restaurants located throughout the airport for their convenience; with restaurants and coffee shops such as Memphis City Blues Wine Bars and Starbucks coffee shops. Along with the usual shopping and dining, Memphis International airport car hire desks are also available at the terminal for the travelers arriving. Car hire at Memphis international Airport means easy Memphis sightseeing including attractions such as the Sun Studio where the King of Rock n’ Roll, Elvis Presley, recorded his first song ever. Memphis has been the subject of many pop and country songs and is a place worthy of visiting. Take a cruise down the Mississippi river by booking a riverboats cruise package. Settled on the banks of Mississippi River, this Pyramid is the 3 rd largest in the world. Liberty land is a family attraction that offers more than 20 exhilarating rides. Home to the legendary Elvis Presley ,this building gives you an insight on his lifestyle.